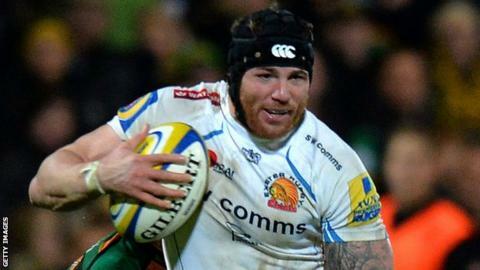 Exeter flanker Ben White has signed a new two-year contract. The 31-year-old Australian moved to the Chiefs from Cardiff Blues in the summer of 2011 and has played 12 times this season, starting the first five Premiership games. "He works extremely hard and I think he's one of those guys who can glue a team together," head coach Rob Baxter told BBC Sport. "He's a fantastic character and a very popular guy around the squad." White has scored 14 tries in his Exeter career, having moved to the UK from ACT Brumbies in 2006. "When you watch a game off hand you probably see two or three moments in a game where he really excels, but when you look at his game closely you really see his value," Baxter said. "Whenever he plays he's one of our high-numbers players - he's very good at securing breakdown ball, he makes a high number of tackles and he's very involved in the energy in our kick-chase. "It allows the other players, who probably get the headlines a bit more than Ben does, to be able to go out there and play. "It's great credit to him that it was a very easy decision to keep him around."